The payroll records provide the strongest evidence that over the last decade the government’s five-star rating system for nursing homes often exaggerated staffing levels and rarely identified the periods of thin staffing that were common. Medicare is now relying on the new data to evaluate staffing, but the revamped star ratings still mask the erratic levels of people working from day to day. Medicare officials, until recently, relied on nursing homes to provide staffing data, allowing operators to “game the system.” Uncle Sam does not set a minimum resident-to-staff ratio, though it does require the presence of a registered nurse for eight hours a day and a licensed nurse at all times. Nearly 1.4 million people are cared for in skilled nursing facilities in the United States. When nursing homes are short of staff, nurses and aides scramble to deliver meals, ferry bed-bound residents to the bathroom and answer calls for pain medication. Essential medical tasks such as re-positioning a patient to avert bedsores can be overlooked when workers are overburdened, sometimes leading to avoidable hospitalizations. Nursing home officials denied their facilities skimp on staff and harm patients in doing so. They defended their staffing, relying on averages and noting that numbers may look low, for example, on weekends, when, they contended, friends and family visits are more common so fewer caregivers may be needed. To see how select homes’ fluctuate in staffing, the New York Times — which partnered with Kaiser Health News to publish the nursing home investigation — has posted a nifty info graphic that lets readers punch in a facility name and location and then get targeted data on it. Click here to try it. Medicare officials said they are analyzing their payroll information but are concerned with what the data are showing them. They should be, based on reports from the giant nursing home market of California, where new staffing regulations are adding to already big concerns. Yes, some of the loudest voices are coming from unions representing health care workers. But the message should be loud and clear: The demand for caregivers, especially for certified nursing assistants, is soaring, while the supply is thin. The job is taxing and can be high in responsibilities, but it pays poorly — barely above minimum wage. In California, as is true across the nation, the number of nursing home patients is big — 100,000 annually and rising, while there are roughly 32,000 certified nursing assistants, the Los Angeles Times reported. This means nursing homes will be hard pressed to meet new requirements to increase the number of direct patient care hours to 3.5, from 3.2. (That would, by the way, put California in line with rules in place for the District of Columbia, but ahead of Maryland with its 2 hour rule and Virginia, which has no minimum.) California homes will face fines for failing to comply with the increased staffing rules. But who is dealing with the broader issue here: With our rapidly aging nation already confronting a shortage of primary care doctors and specialists, as well as of registered nurses, where in the world are not just nursing homes but also hospitals and other care-giving facilities, supposed to get the people — certified nursing assistants — to do hard, basic labor that many might consider crucial but too menial? 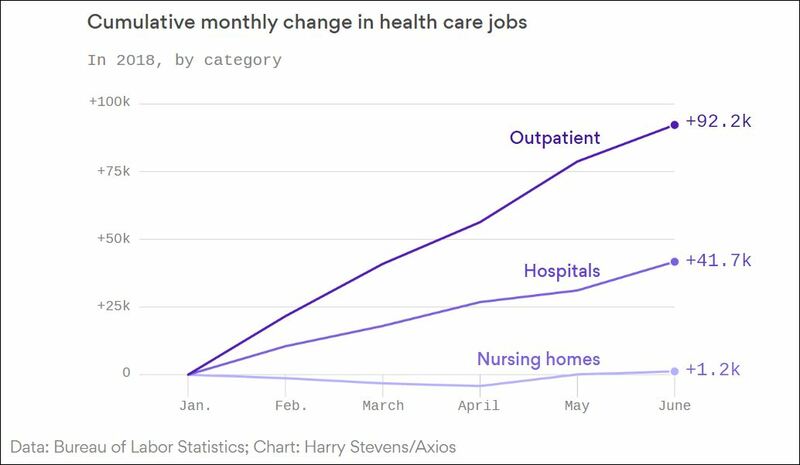 If you follow trends in health care hiring, however, you might see that administrative and support jobs, including for high-paid managers and executives, are the areas that are booming most. The New York Times reported that America leads the world in the cost of administering its health care system, devouring 25 percent of hospital spending an accounting for an expense the paper headlines as “astonishingly high.” Employment of those who provide direct patient care, meantime, is growing but lagging behind the paper pushers, including a big and growing number of increasingly specialized workers focused on billings. In my practice, I see the harms that patients suffer while seeking medical services, and their struggles to access and afford safe, efficient, effective, and even excellent medical care. As more baby boomers require medical care and hospitals seek to shift patients to less costly treatment options, more of us than expected will be forced into nursing homes, which already are too rife with neglect and abuse. Staffing shortfalls already have contributed to nursing homes’ over-medicating patients, off label, with powerful anti-psychotics to make them more complaint, turning 180,000 residents into drug zombies. With the average cost of a semi-private room in a nursing home running at more than $85,000 annually, operators of facilities need to stop crying “poor us,” and pay their staff better (yes, profiteering less to do so) to ensure the quality of their patient care. Medicare officials also need to up their game, so they’re not finding key and disturbing data on nursing home care served up by crack reporters like Rau, rather than their own staff. And lawmakers and politicians need to get out of their partisan pettiness and feuding to grapple with major health care matters like the nation’s talent supply. By the way, that might mean those bellowing about immigration might need to not just turn down the volume but also to rethink their positions. 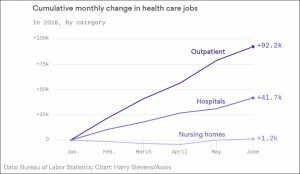 The US health care sector, urban and rural, has become reliant on labor from outside the nation’s shores, in advanced as well as basic health care positions, everything from physician specialists to those who mop hospital floors. Extremists, to their dismay, could find in their declining days that they will need not only foreign-born doctors but also in their nursing home, immigrant nursing assistants to feed, bathe, and even take them to the bathroom. Call it karma.